The more you learn about ALS, the better prepared you'll be. Remember, in addition to doing your own research, speaking regularly with your healthcare provider(s) will help you make the most informed decisions moving forward. Amyotrophic lateral sclerosis (ALS), also known as Lou Gehrig’s Disease, is a disease that affects parts of the nervous system that control voluntary muscle movements (the muscles that people move at will, like those of the arms and legs). ALS is referred to as a progressive disease, meaning the symptoms continue to get worse over time. People with ALS gradually lose strength in their muscles and become weaker, which can limit movement and the ability to live an independent life. As ALS progresses, it will eventually affect muscles that control breathing, as well as chewing and swallowing food. Currently, there is no cure for ALS. However, it's important to ask your healthcare provider(s) about treatment options. ALS begins in the brain and spinal cord by affecting nerve cells called motor neurons. 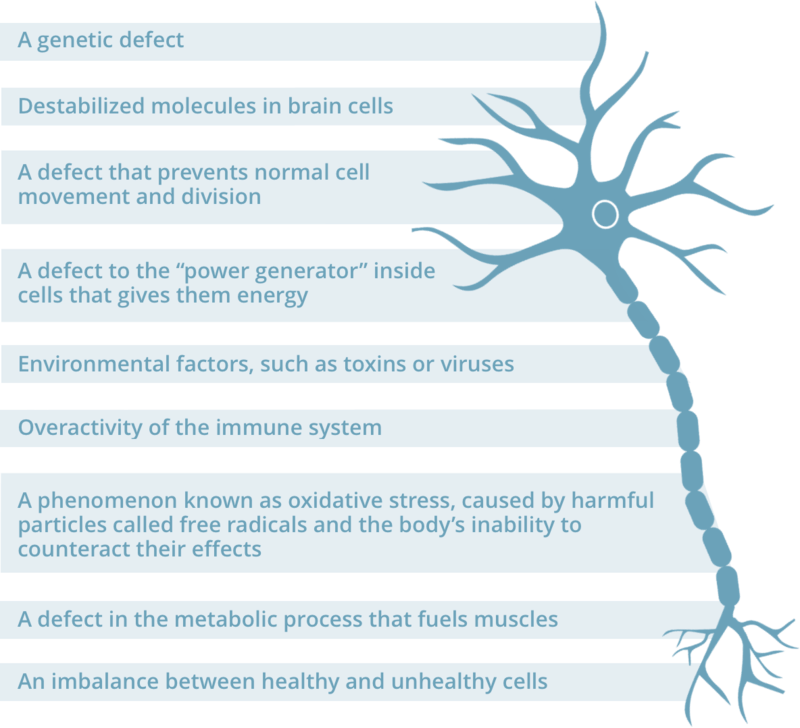 Motor neurons extend from the brain to the spinal cord, and from the spinal cord to voluntary muscles throughout the body. Motor neurons provide a vital line of communication between the brain and muscles, which produce movements like walking, chewing, breathing, and talking. In people with ALS, these motor neurons stop working. When this happens, the brain can no longer communicate with the muscles. Over time, the brain loses its ability to initiate and control certain muscle movements, resulting in progressive weakness and paralysis. People living with ALS may eventually need assistance with speaking, eating, and breathing on their own. ALS spreads at different rates for everyone. Talk with your healthcare provider(s) about how your ALS is progressing. Knowing which parts of your body are affected by ALS can help you and your healthcare provider(s) better understand how ALS will impact you moving forward. Because of the individual nature of ALS, it’s extremely important that you speak with your healthcare provider(s) about all symptoms you may be experiencing. The symptoms of ALS get worse over time. Therefore, it’s important to carefully monitor these symptoms and track your disease activity. This can help you and your healthcare provider(s) better understand how ALS is affecting your body and how quickly it’s progressing. Doctor-administered questionnaires ask people with ALS to rate how well different muscle groups are working, based on a sliding scale. The individual scores for each muscle group are then tallied, providing a high-level assessment of overall muscle function. The most well-known questionnaire is called the ALS Functional Rating Scale-Revised (ALSFRS-R). Since muscle weakness is a major feature of ALS, measuring strength over time can help your healthcare provider understand how quickly ALS is progressing. The most commonly used strength measurement is called handheld dynamometry (HHD). During HHD, the examiner holds a small gauge that the patient pushes against using different muscle groups. 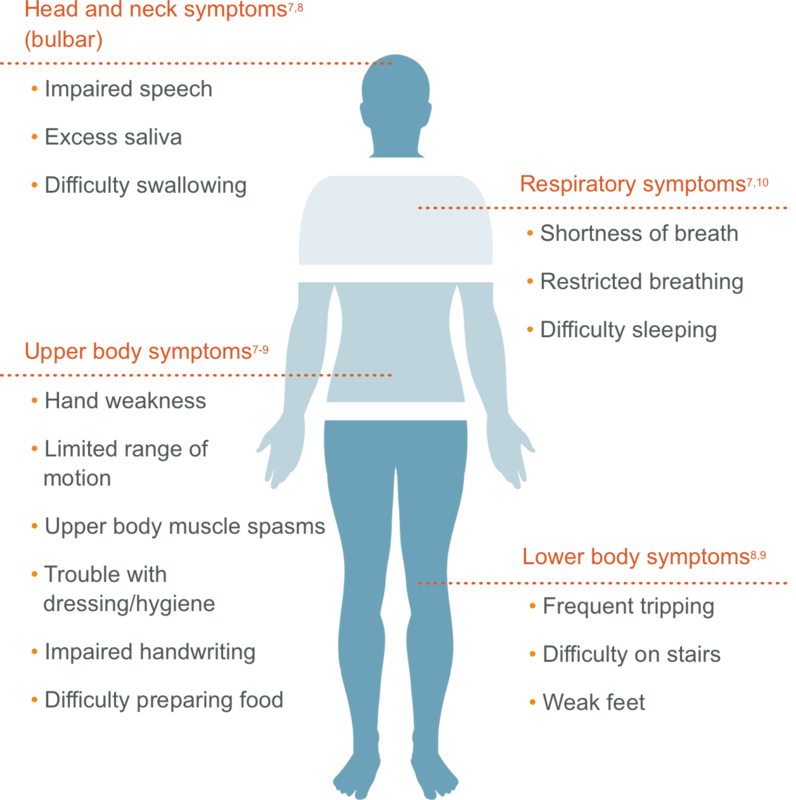 As respiratory (breathing) dysfunction remains the most common cause of death among people with ALS, assessing lung function is extremely important. A forced vital capacity (FVC) test is typically used for this. A FVC measures the maximum amount of air a patient can exhale from their lungs after taking the deepest possible breath. Ask your healthcare provider(s) about different measurements to track your ALS. References: 1. 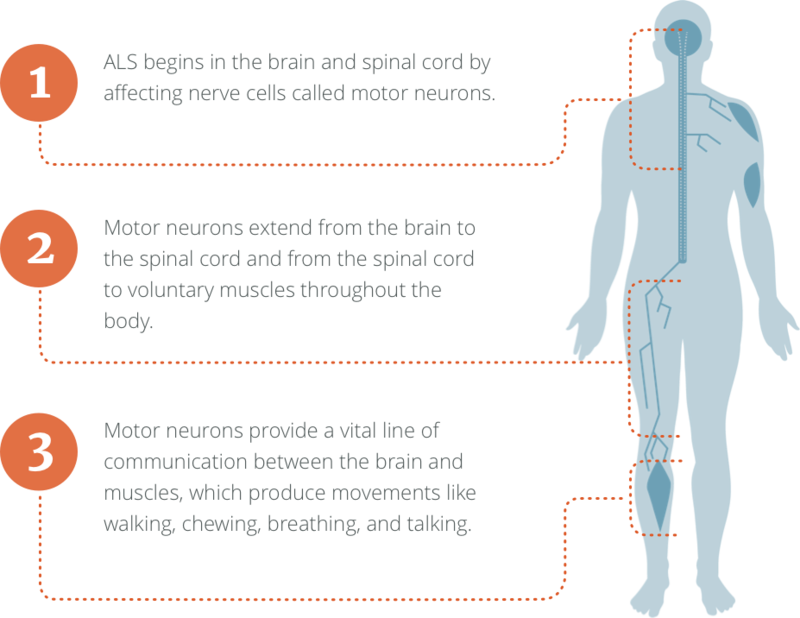 Amyotrophic lateral sclerosis (ALS) fact sheet. National Institute of Neurological Disorders and Stroke website. https://www.ninds.nih.gov/Disorders/Patient-Caregiver-Education/Fact-Sheets/Amyotrophic-Lateral-Sclerosis-ALS-Fact-Sheet. Published June 2013. Accessed April 13, 2017. 2. What is ALS? ALS Association website. http://www.alsa.org/about-als/what-is-als.html. Accessed April 13, 2017. 3. Quick facts about ALS & the ALS association. ALS Association website. http://www.alsa.org/news/media/quick-facts.html. Accessed April 13, 2017. 4. What is ALS? 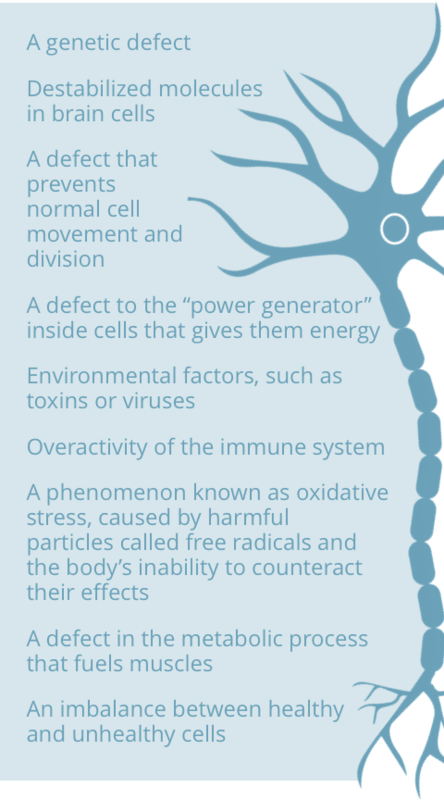 ALS Therapy Development Institute website. http://www.als.net/what-is-als/. Accessed April 13, 2017. 5. Beghi E, Mennini T, Bendotti C, et al. The heterogeneity of amyotrophic lateral sclerosis: a possible explanation of treatment failure. Curr Med Chem. 2007;14(30):3185-3200. 6. Symptoms and diagnosis. ALS Association website. http://www.alsa.org/about-als/symptoms.html. Accessed April 13, 2017. 7. Cedarbaum JM, Stambler N, Malta E, et al. The ALSFRS-R: a revised ALS functional rating scale that incorporates assessments of respiratory function. J Neurol Sci. 1999;169(1-2):13-21. 8. Mitchell JD, Borasio GD. Amyotrophic lateral sclerosis. Lancet. 2007;369:2031-2041. 9. Amyotrophic lateral sclerosis: symptoms and causes. Mayo Clinic website. www.mayoclinic.org/diseases-conditions/amyotrophic-lateral-sclerosis/symptoms-causes/dxc-20247211.2016. Accessed March 13, 2017. 10. ALS Society of Canada [Internet]. Toronto: ALS Canada; [cited 2018 August 15]. Pseudobulbar affect; [about 1 paragraph]. Available from: https://www.als.ca/wp-content/uploads/2017/04/ALSCAN-Pseudobulbar-Affect-EN.pdf. 11.Rutkove SB. Clinical measures of disease progression in amyotrophic lateral sclerosis. Neurotherapeutics. 2015;12(2):384-393.